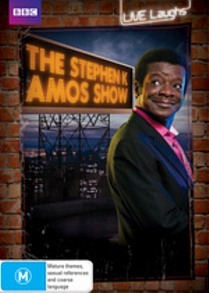 UK comedian Stephen K Amos has forged an eminently impressive career as a stand up, his impeccably crafted and perfectly timed live shows garnering rave reviews and a strong following the world over. Currently in town for the 2011 Melbourne International Comedy Festival, where he’s long been a fan favourite, Amos is performing his show ‘The Best Medicine.’ Selling out fast and already described as ‘classic’ by one reviewer, the show sees Amos once again mining the endless well of jokes about his Nigerian parents, finding the humour in a variety of absurd and often tragic scenarios or simply indulging in some good natured piss-taking (his Australian bogan accent is spot on, and of all his impersonations always guarantees a riotous reception). and comprised an unconvincing hodge-podge of dubious stand up, half-baked skits and pancake-flat one liners, interspersed with the odd bit of Amos magic. His guests were largely a bewildering blend of obscurities (at least to us in the Antipodes) though the odd name performer such as Michael Parkinson makes the occasional cameo and some of the stand-ups were eminently impressive. Largely though, this is a waste of time for all but the most stalwart fans of the debonair comedian, and seeing Amos live is still the only way to experience his full comedic arsenal. As far as sketch shows go, I for one will be sticking with Mitchell & Webb. No problems here. The series looks great in a pristine anamorphically enhanced 1.77:1 widescreen transfer, and the two-channel DD audio is perfectly respectable as well. Six deleted sketches, most of which are actually pretty decent, particularly ‘Wacky Racists’ and one in which Amos stars as a Bond with misfiring gadgets. Not sure why these weren’t included in the show proper as they’re funnier, for the most part, than some of the sketches that did make it to air.